I updated to RC branch, looks like I might have to add a 3rd column in the vehicle store to allow for parts customization, like in the Eden appearance editor, so that people can toggle built-in camonets and cages. Seems all the new launchers have no lock-on at all, however the 9M135 Vorona has mouse guidance like the Titan compact. Nice! thanks for still working on this mission Rev. Mostly wanted to say hi, i do run a server for friends now days. Its 'only' PVE as we play as a group and run the missions but what you have built is really nice for what we need, only other addon we use is COS and ill might want to add AISSP for the AI to properly get into the buildings (i might up the mission on github when i feel it wont give you to much headache and i think i get the instructions right so hopefully no one bother you with.... things). thanks again. If anyone has any nice missions to add feel free to pm me. 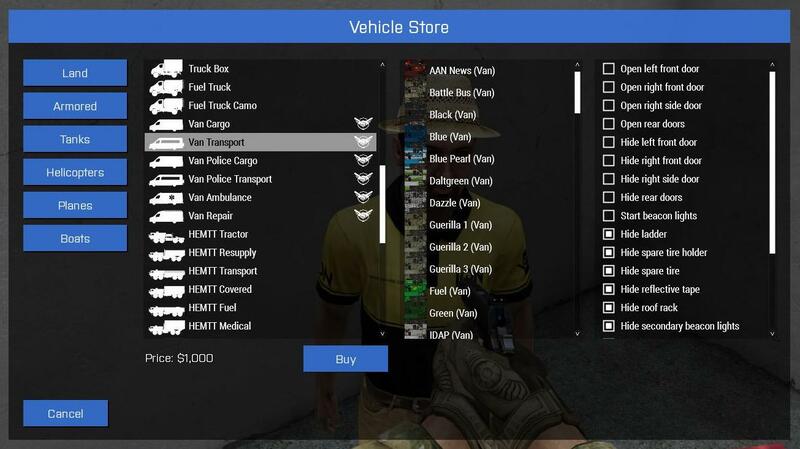 That's a wonderful idea about the vehicle store upgrade. Hey there Cael, long time no see, been like... 2 years. Also the new launchers are available to non-DLC players. For those wondering about the difference between the MAAWS Mod 0 and 1, the Mod 1 has nightvision and a laser rangefinder, otherwise they are identical in all other respects. Thank god, been waiting for something better to use for our GL's. It'll be interesting to see how the play-style dynamic changes with the new vehicles. using vanilla mission file i get this ?